ALBUQUERQUE, N.M. (KRQE) – The Bernalillo County Sheriff told KRQE News 13 on Wednesday that he has launched an internal investigation to find out who used the department’s official Twitter account to accuse him of giving his friends special treatment. Someone logged into the official Twitter account of the Bernalillo County Sheriff’s Department Wednesday afternoon, using it to publicly criticize the department. After a post announcing Sheriff Gonzales’ new choice as undersheriff, Sargent Larry Koren, the department account then sent this tweet: Cronyism at its finest. It called Koren’s qualifications into question. His appointment as undersheriff from sergeant means he skipped a few ranks, like lieutenant, captain, commander and chief deputy. “We posted his qualifications. I stand by my decision that he’s fully qualified,” Sheriff Gonzales said. He said Koren’s been with the department for nearly 20 years, holding positions like helicopter pilot, public information officer and crisis negotiator, and he has a masters in criminal justice from New Mexico State University. “So, this comes actually shockingly to all of us,” Sheriff Gonzales said. When KRQE News 13 arrived to sit down with the sheriff, lots of deputies were at the station late, and the sheriff said interviews were continuing into the evening to find out who posted the tweet. The Bernalillo County Deputy Sheriff’s Association said in a statement that command staff from the rank of lieutenant on up were ordered to the main Sheriff’s station at about 4 p.m. in reference to the ongoing investigation. “It is unclear at this time if the tweet originated from inside the department as the investigation is ongoing. 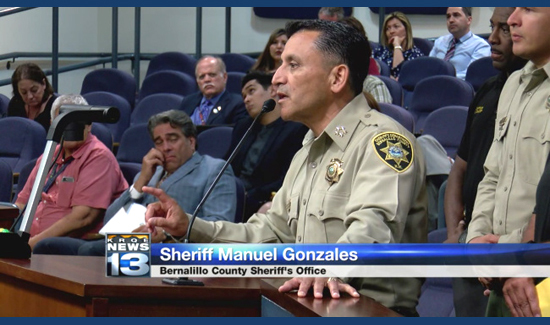 The Bernalillo County Deputy Sheriff’s Association fully supports its members who are currently involved in this investigation and more information will be forthcoming as it becomes available,” the union said. Sheriff Gonzales didn’t say how many, but said command level officers have access to the department’s Twitter account.